Growing up with an Air Force father, Lee Anne Chesterfield, the new director of the Harn Museum of Art, traveled and moved around a lot as a kid. Living across the U.S. as well as in Turkey and England, she says that the artwork she saw in her travels — from museums to rock art and archeological sites — left a lasting impression on her. One of Chesterfield’s main goals since joining the Harn in July from the Virginia Museum of Fine Arts (VMFA), where she was senior advisor for Museum Planning and Board Relations, has been figuring out how to increase art’s impact on more people by making an already welcoming place even more accessible. Chesterfield is hoping to do this in several ways, including expanding the museum’s hours into the evening so that employees, students and community members can visit after work or classes. 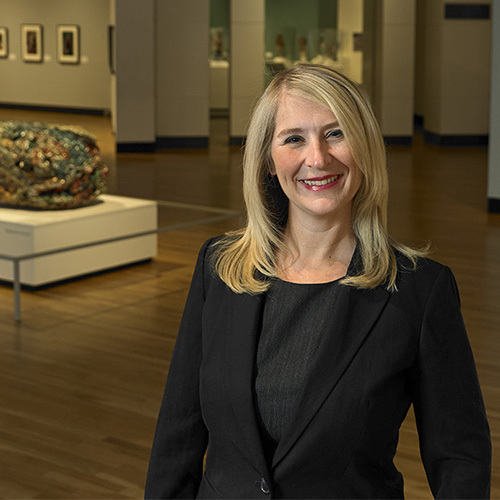 She and her team will also maintain the museum’s partnerships with faculty, staff and students in colleges and departments across UF, continuing to foster the connections between the classroom and the art world, of which there are many. Additionally, Chesterfield seeks to continue bringing in exhibits that visitors are not going to see elsewhere. The Harn’s mission is to collaborate with university and community partners to inspire, educate and enrich people’s lives through art. Since opening in 1990 after the family of the late Samuel P. Harn made the founding gift for the museum’s construction, the museum has served a wide audience through free admission and a variety of community programming for visitors of all ages. In addition to ample exhibition space, the Harn is home to five gardens, an auditorium, study center, museum store, café and classrooms. Its collection, which includes more than 11,300 pieces of art, is comprised of African, Asian, modern and contemporary art and photography with significant representations of Ancient American and Oceanic art and a growing collection of natural history works on paper. Chesterfield counts this rich collection, incredible staff and dedicated supporters as the major strengths of the museum, as well as the tireless efforts of former Director Rebecca Nagy. Before coming to the Harn, Chesterfield rose through the ranks at the VMFA, serving in such roles as interim deputy director for Art and Education and the museum’s first curator of Ancient American Art. She also directed the opening of the VMFA’s first permanent galleries of Native American and Pre-Columbian Art, her doctoral specialty. As a graduate student in art history and later, Chesterfield taught courses on art and architecture. She considers her new role a teaching opportunity as well, from giving tours — her favorite part of the job — to meeting with leaders across campus to advocate for the museum and its programs. Before the bustle of visitors and the activities of a recent day began, Chesterfield had the chance to wander through the Harn’s newest exhibit, “I, Too, Am America: Civil Rights Photographs by Steve Schapiro,” before work one morning. The exhibit, which will be up through March 31, is comprised of nearly 50 photographs from the late 1950s/1960s Civil Rights Movement. Curated by the Harn’s Curator of Photography Carol McCusker in collaboration with photojournalist Schapiro — who traveled with James Baldwin, Martin Luther King Jr., Robert Kennedy and Muhammad Ali in the 1960s — the exhibit’s title comes from a poem by Langston Hughes. Another current exhibit she is excited about is “The World to Come: Art in the Age of the Anthropocene,” which will be on display through March 3. The exhibit chronicles an era of rapid ecological change through photos and videos by 45 contemporary international artists. Chesterfield believes that in trying social and political times, art is more important than ever. Not only does experiencing art inspire viewers in their own creative pursuits, but studies have shown that interacting with art can improve mental health and other health outcomes.